This collection contains ten letters written by Lt. James "Newt" Martin, a Newberry native who enlisted as a private in Co. E, 3rd SC Volunteer Infantry at age 29. 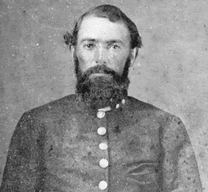 He was elected Lieutenant on December 31, 1863, and served throughout the entire war. The letters span over two and a half years of the Civil War, from January 1862 to August 1864. Not only do these letters provide insight into the conditions that Martin and his fellow troops faced during battle, but they also show how he occupied his camp time, his thoughts on the war, and how he stayed connected to his family. The letters are all written to his father, sister, or brother and he describes everything from a snow storm near Fredericksburg and camp minstrel shows to Union spy balloons and religious services. Following the war, Martin returned to Newberry where he married, ran a mercantile business, and became the president of the National Bank of Newberry. He died on May 31, 1899, and is buried in Newberry's Rosemont Cemetery. Below is a sampling of the letters, with full transcriptions (PDFs).